The Great Red Spot is a giant spinning storm in Jupiter’s atmosphere that’s been raging for about 400 years. The Great Red Spot is more than twice the size of our dear blue planet and reaches speeds of about 434 km/h (270 mph). Scientists at NASA have been observing this storm for a while now, and have come across a new observation—they have detected signs of water just above the planet’s deepest clouds. Researchers say that the pressure of the water mixed with its measurement of another oxygen-carrying gas, carbon monoxide, imply that Jupiter contains two to nine times more oxygen than the Sun. Published in the Astronomical Journal, the findings support theoretical and computer-simulation models that have previously predicted the presence of large amounts of water on Jupiter. The Great Red Spot is full of dense clouds. This makes it hard for electromagnetic energy to escape, thus allowing astronomers to learn very little about the chemistry happening within. “It turns out they’re not so thick that they block our ability to see deeply,” comments Gordon L Bjoraker, an astrophysicist at NASA’s Goddard Space Flight Center. The data collected recently by NASA will supplement the data collected by the space agency’s Juno spacecraft, which at the moment, is around the giant planet with its own infrared spectrometer and a microwave radiometer that can probe deeper into Jupiter than anyone has probed before. “If it works, then maybe we can apply it elsewhere, like Saturn, Uranus or Neptune, where we don’t have a Juno,” comments Amy Simon, Goddard Space Flight Center’s planetary atmospheres expert. 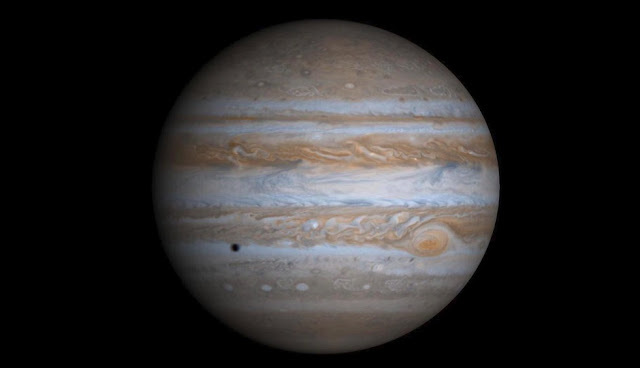 A theory that was widely accepted until some several decades ago is that Jupiter is identical to the Sun in composition and that it is a giant ball of hydrogen with a touch of helium. In other words, it was thought to be full of gas and no core. But this theory is seeing more and more evidence against it. The theory prevalent now is that Jupiter does have a core, and it’s possibly ten times heavier than the Earth. “Jupiter’s water abundance will tell us a lot about how the giant planet formed, but only if we can figure out how much water there is in the entire planet,” says Steven M. Levin, a Juno project scientist at NASA’s Jet Propulsion Laboratory in California. At any rate, the days and years ahead will tell us more about the largest planet in our solar system. Click here to read about the 12 new moons recently discovered around Jupiter.